Rusie's fastball forced the rule makers to move the pitching distance from 45 feet to 60 feet 6 inches. From 1890 to 1895, the Giants pitcher led the NL in Ks five times, yet he walked nearly one man for every strikeout. 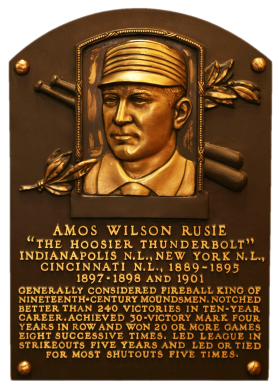 "The Hoosier Thunderbolt" had eight 20-win seasons and 24 career victories in only nine full seasons, before he as traded to Cincinnati for Christy Mathewson. Comments: In May, 2003 I purchased a 1994 American Archives card raw on eBay. Soon thereafter I submitted it to PSA and they graded it NM-MT. The tribute card is a placeholder until I have the means to buy an item contemporary to Rusie's career. I'd really like a 1895 N566 Newsboy Cabinet - just need to set aside enough money and get lucky finding one. 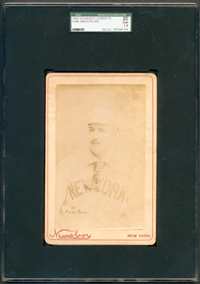 For a while, I had a 1895 N300 Mayo's Cut Plug SGC 50 example that I purchased in Aug, 2005 but sold it in 2012 to free up some cash. 1) What other items were found in the scrapbook? Other baseball-related items? Other Newsboys? Are there any pictures of the scrapbook? 3) Does he know how the scrapbook ties to the estate? Was it grandpa's from his childhood? Or, one of grandma's garage sale finds? Do they remember seeing any other baseball stuff at the estate sale or anything else that would make him believe the scrapbook originates from the estate? 4) Their thoughts when they first spotted the baseball cards…. Unfortunately, we never heard back. Upon receipt, it was exciting to open the box and handle the cards. They were all pretty frail. Of the group, the Rusie was the most attached to the cardboard stock (approx. 90%), but the cardboard backing exhibited the most separation of layers. The photo was also the dullest of the five. It had a small crease in the upper right corner but no significant staining or pencil writing. The photo layer was smooth and even; with good gloss. Overall, I was still very pleased. I'll be selling the other four cards to recoup some of my investment. Hopefully, I do well. UPDATE: In November, 2013 I shipped off three of the Newsboys to SGC for grading (Tiernan, Burke, and Rusie). They all came back authentic with number grades. The Rusie received a SGC 20 rating - very pleased. I'm keeping the Rusie and have consigned the others to auction houses hoping they do well. 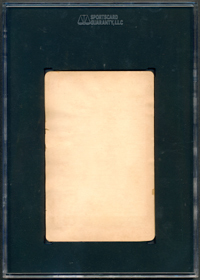 Description: Issued in the 1890s by the National Tobacco Works, this massive cabinet card set was distributed as a premium with the Newsboy tobacco brand. 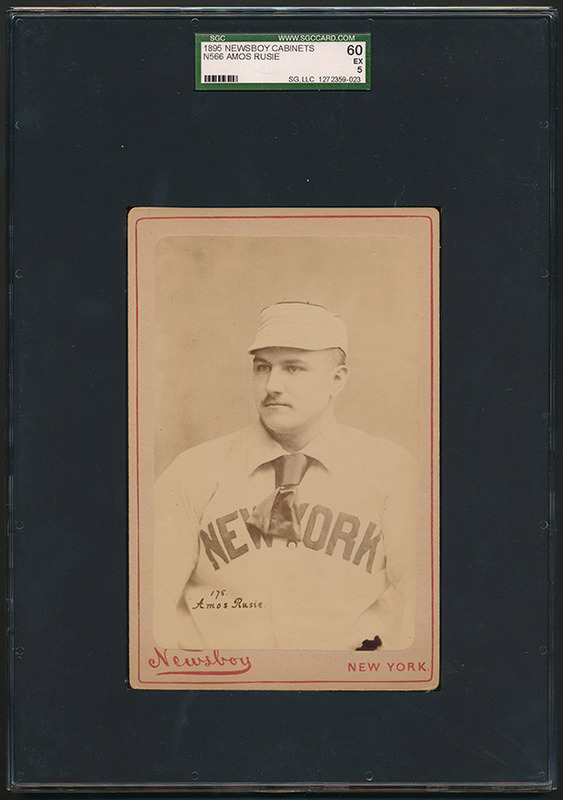 Although the set contained over 500 popular actresses, athletes, politicians, and other celebrities of the day, only about a dozen cards of baseball players have been found. 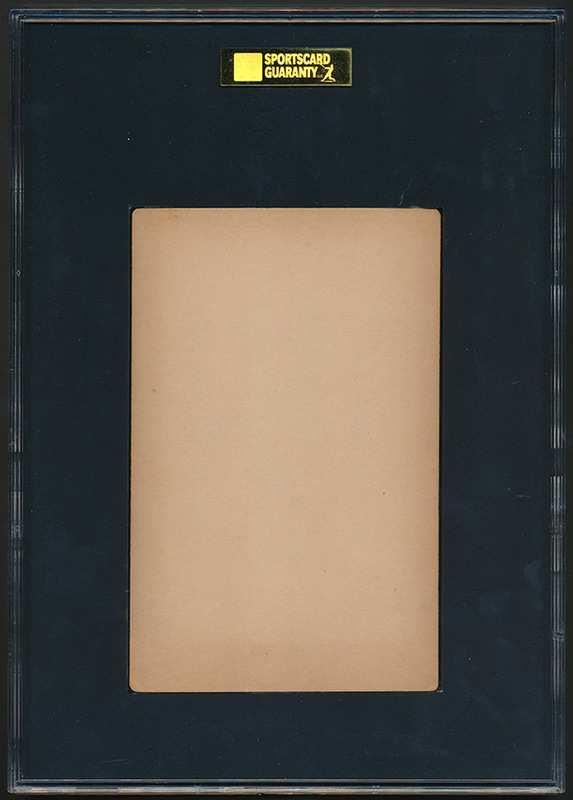 The cards measure 4-1/4" X 6-1/2" and feature sepia-toned photographs mounted on a backing that usually has "Newsboy New York" printed at bottom. Each portrait photograph is numbered and a few of the photographs are round. The ballplayers in the set are mostly members of the New York Giants with a couple Brooklyn players. There are two known poses of John Ward. Cards have been seen with adverising on the back for the Keystone cigars and Red Indian tobacco.